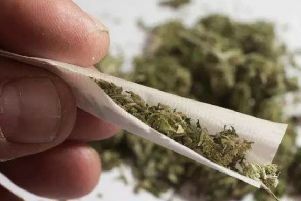 A jilted boyfriend who turned to drugs after he found his ex-partner in bed with another man has been fined for possessing cannabis. Chesterfield magistrates’ court heard on Friday, July 29, how Samuel Hodgkinson, 26, was discovered with two grammes of the class B drug at a former address by police while they were investigating another matter. Hodgkinson, formerly of Heanor, had been given a conditional discharge in March for previously possessing amphetamine and cannabis just one month before the two grammes of cannabis was found by police in April. The defendant, now of Thatchmarsh Close, Ilkeston, told police the two grammes of cannabis was for his own personal use. Jobless Hodgkinson pleaded guilty to possessing cannabis after the discovery on April 26. Defence solicitor Robert Wetton said: “He pleaded guilty at the first opportunity and accepts that by committing this offence he has breached a conditional discharge just a month after it was imposed. “Police had attended the address on another matter that came to nothing and was a wild goose chase but he said the drugs that were found were for his personal use. “At the age of 26 he suddenly finds himself before the courts. Hodgkinson has been diagnosed with mental health difficulties after the breakdown of his relationship, according to Mr Wetton, but he has sought counselling and is now looking for work. Magistrates fined Hodgkinson £120 and ordered him to pay £85 costs and a £30 victim surcharge.